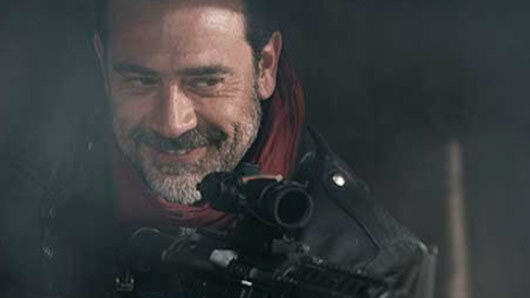 Negan wasn’t always the sadistic and assured leader of the Saviours we know today, according to actor Jeffrey Dean Morgan. Morgan delighted fans today at London’s Walker Stalker Convention by relaying to the crowd the backstory behind The Walking Dead‘s biggest ever villain, created by showrunner Scott Gimple. Speaking to the hordes of fans gathered to watch a panel featuring Morgan, Dwight actor Austin Amelio and Simon actor Steven Ogg, Morgan was asked if there was anything the character wouldn’t do. He responded by telling Negan’s “awesome” back story. He told the crowd: “Negan wasn’t always the Negan we know and love now. He was a high school PE teacher. “He did some stuff obviously that wasn’t great but it was nothing that a lot of people in this room probably haven’t done at one point or another. “It’s interesting to see what he was before this zombie apocalypse and how he became Negan, this ruthless leader. “He got sick of trying to tell people how they could survive in this zombified world, they wouldn’t listen to him and they got killed. “It got to a point where he thought, well goddammit, I’m going to make my rules. And with those rules came Lucille, and we’ve kind of seen what happens when you don’t follow those rules… but those rules originally came about because he was trying to save people’s lives, which is not unlike what we’ve seen Rick and the survivors do.